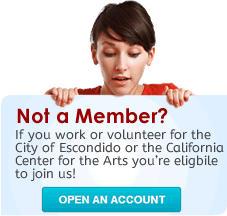 Flexible and safe, Escondido Federal Credit Union's share savings offer a lot of benefits for building up savings. You can also use our regular savings accounts for direct deposit, loan payments, or overdraft protection. For higher balances, consider our Money Market Account, which earns a higher dividend rate for higher balances but is flexible in allowing access to your funds without the penalty of a Term Certificate Account.